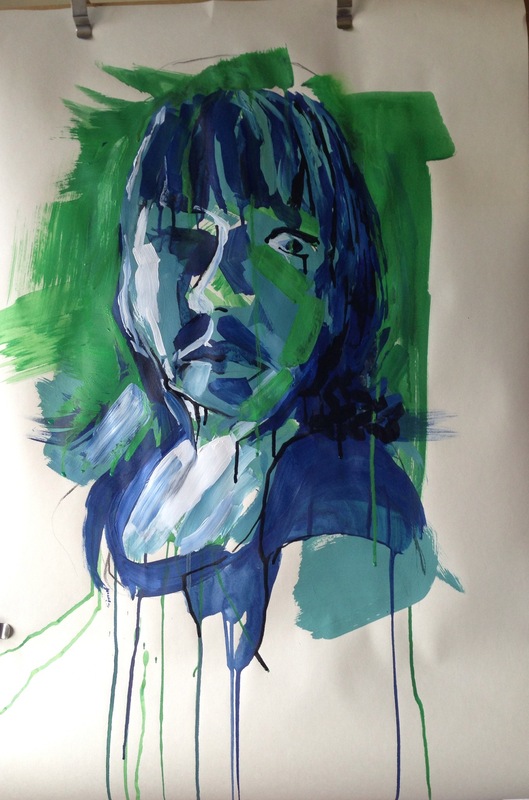 I decided this should be a self-portrait – the challenges of getting a family member or friend to commit their time outweighed the minor inconveniences encountered when trying to paint myself. From previous experience I knew I needed time to work on this as and when I could and to not feel pressurised or feel under any time constraints. I also wanted to set up a background and context for the portrait and leave it undisturbed for the duration – so this was the best option. I wasn’t sure whether my portrait should be close up – the idea of standing back for a full length portrait was appealing mainly because I hadn’t done one before (and I had bought a bargain full length mirror on eBay just for this purpose!) – equally I was also keen to experiment further with a close-up following the quite successful (I thought) “Head and shoulder portrait” in inks and the scary not so successful “Creating mood and atmosphere” exercise. 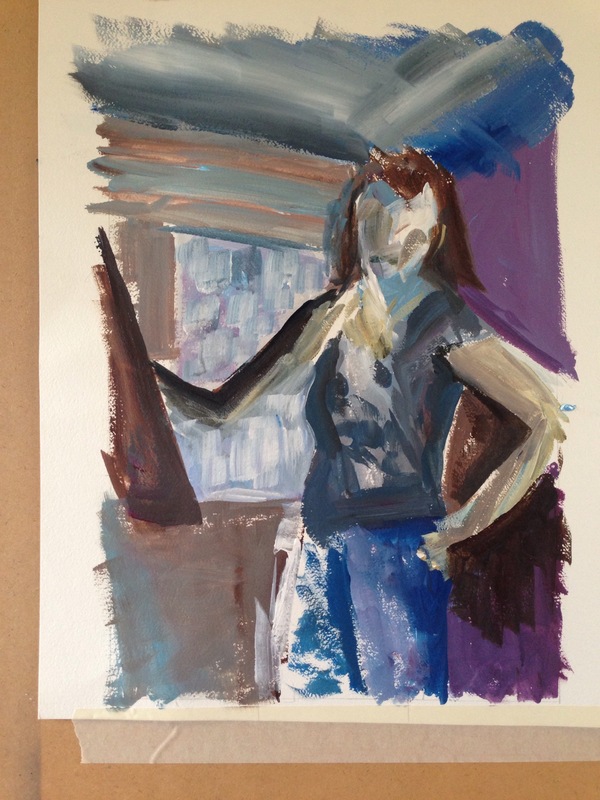 I rejected the idea of a seated portrait – this would be difficult in terms of balancing a large board on my lap and I wouldn’t be able to stand back from it. Catherine Goodman –“The Artist” (Npg.org.uk, 2014). I really like how this image is so strong and the whole painting seems integrated – the paint marks and splashes, the easel and the background are at one with the head and shoulders. R.B. Kitaj “Self portrait” (Tate, 2007). Is this more drawing than painting? But I do like how the paint marks draw attention to the features and lead the eye the around – and how the character and personality has been conjured up by line alone – there is no tonal shading. An image in “ModernPainters” (July/August edition) which led me to the work of Andrei Sharov (Salamatina.com, 2014). I am so inspired by his use of colour – the mood conveyed is vibrant and the way he manipulates the subject is exciting and original. It is interesting to see how he has dealt with the same subject in different palettes and styles in “Seated Woman in Blue” and “Seated Woman in Red Hat”. Also prominent in my mind was our recent trip to the South of France where we visited La Chapelle du Rosaire designed by Matisse in Vence and the Musée National Marc Chagall in Nice. The stained glass windows in the Chapelle were exquisite – the bright sunlight through the windows cut in organic leaf shapes and patterns cast intense reflections against the white marble floors – I found it quite moving. Similarly Chagall’s stained glass windows at the Musée were equally inspiring with his use of brilliant, translucent colour and bold yet simple pattern. I think these initial sketches although, a little bit superficial and decorative, definitely had potential for development – however, on reflection, I decided to move on to a different theme and to explore a full length portrait possibly incorporating some elements of the stained glass windows into my background. I set myself and easel against the window and began with some loose studies, trying to find an arrangement which would work compositionally – the room was quite cluttered and I wanted to simplify and bring out the strongest shapes. I was undecided about how much background to include, how much context to bring to the figure and whether to show the edges of the mirror and the room beyond. Npg.org.uk, (2014). 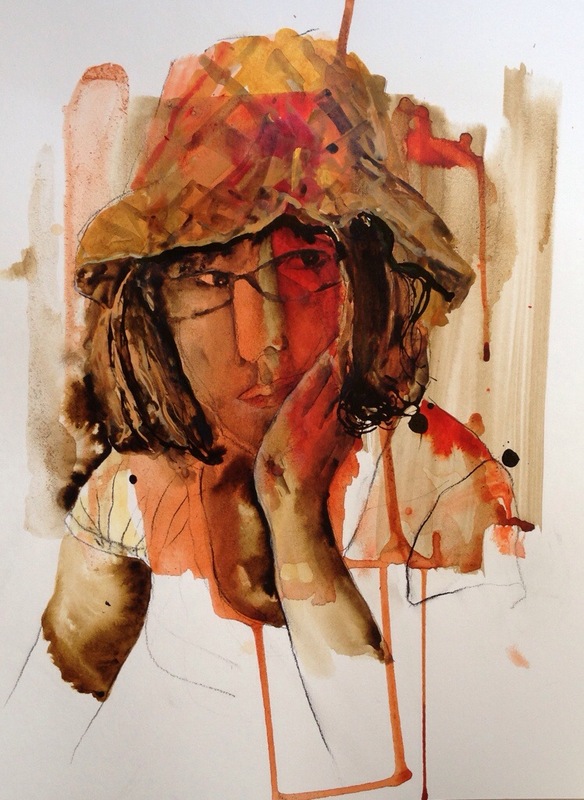 National Portrait Gallery – Catherine Goodman: Portraits from Life. [online] Available at: http://www.npg.org.uk/whatson/display/2014/catherine-goodman-portraits-from-life.php [Accessed 17 Oct. 2014]. Salamatina.com, (2014). Artist | SALAMATINA GALLERY. [online] Available at: http://www.salamatina.com/andrei_sharov.php [Accessed 17 Oct. 2014]. Tate, (2007). R.B. Kitaj, ‘Self-portrait’ 2007. [online] Available at: http://www.tate.org.uk/art/artworks/kitaj-self-portrait-t13010 [Accessed 17 Oct. 2014]. This entry was posted in Assignment 3 and tagged Assignment 3, self-portrait on October 17, 2014 by Arlene Sharp.